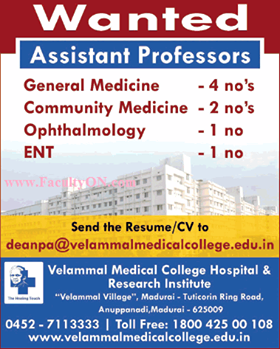 Velammal Medical College Hospital and Research Institute, Madurai has advertised in THE TIMES OF INDIA newspaper for the recruitment of Assistant Professor job vacancies. Interested and eligible job aspirants are requested to apply by earliest. Check out further more details below. About College: Two years back Velammal Group made its foray into healthcare, and within this short span Velammal Medical College Hospital with its state-of-the-art infrastructure, expert medical team and paramedical staff have contributed substantially to the growth of healthy community in Madurai & southern districts. As figures shown below indicate, Velammal takes pride in its commitment to providing the finest health and patient care to the needy. As of June 2013, Outpatient 249072, Inpatient 11947, Major surgeries done 5898, Minor surgeries 20635, New Born 159.